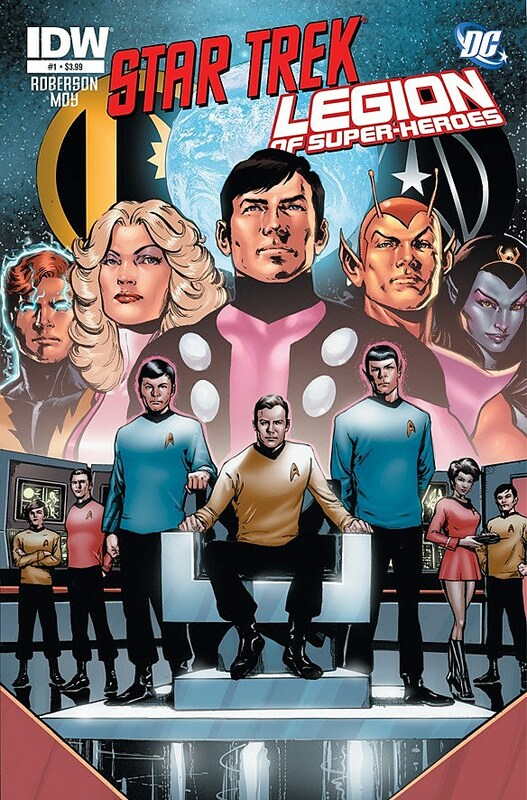 During Comic-Con International, IDW Publishing announced an upcoming crossover that sci-fi fans have been wanting for years: Star Trek / Legion of Super-Heroes, in which the crew of the starship Enterprise meets the space-faring teenagers of DC's far future. To tell the story, IDW tapped iZombie and Superman writer Chris Roberson, who spoke to ComicsAlliance about approaching the story as a fan of both franchises, his plans for the team-up, and how James T. Kirk stacks up against Cosmic Boy. ComicsAlliance: You rarely see people who are casual fans of either the Legion or Star Trek -- most of the time the people who like them are extremely devoted. Where do you fall in terms of being a fan of the franchises? Chris Roberson: Let's put it this way: I've been a member both of the Starfleet Fan Club and the Klingon Language Institute, and my party trick for years is that I can rattle off the real names and home planets of every member of the Legion of Super-Heroes.When I was nine years old, there was nothing that commanded my attention more than Star Trek and the LSH, and the years since haven't dampened my enthusiasm. This project is SO much in my wheelhouse that, when Chris Ryall first approached me about it a few months ago, I simply assumed that it was a prank that one of my friends was playing on me. It wasn't until I was in a meeting with IDW CEO Ted Adams about another project, and asked him point blank, "This Star Trek/Legion thing is a prank, right?" that I was finally convinced that it was really happening. CA: Were there a lot of parties where Legion of Super-Heroes trivia was a crowd-pleaser? CA: So what is it that attracted you to these stories and made you such a fan? CR: Well, as a kid, I think I was just conscious of the fact that both were series about cool people in the future, out in space having adventures. In retrospect, though, I think I was probably reacting to that combination of big ideas and optimism that both Star Trek and the LSH exemplified. Remember that I came of age in the late seventies and early eighties, when popular culture had effectively decided that we would destroy the world sooner or later, and that a post-apocalyptic radiative wasteland was more a question of when than if. But in Star Trek and the LSH, we were given a view of the future where, not only had humanity survived, but we had made things better. We were out there in space, making friends with aliens and having exciting adventures. And honestly, if given the choice between living in post-apocalyptic wasteland or on the bridge of the USS Enterprise (or in Legion HQ, as the case may be), who would choose the wasteland?! CA: Does that optimism come through in the way you see the groups interacting? CR: One of the things we'll be playing with in the series is putting these two groups from optimistic futures in a much less optimistic future, and seeing how they react. You're quite right that the members of Starfleet are going to go about things differently than the Legionnaires, but ultimately I think it's their commonalities that will bind them, more than their differences will separate them. CA: You mention differences, and even on the surface, a military unit -- even one devoted to science and exporation -- wouldn't seem to have a lot in common with a group of idealistic teenagers. What do you seeas their major differences? CR: Well, for one thing, the LSH functions as a democracy, where the Enterprise follows a military command structure. No one voted Jim Kirk to be captain of the Enterprise. But more than that, I think that the Legionnaires function primarily as a collection of individuals, with lots of interpersonal tensions, where the Enterprise functions as a cohesive unit. There are emotional conflicts among the Enterprise bridge crew, of course, but they are secondary to their unit cohesion. CA: Which Legionnaires are you going to be using in the story? CR: We may get glimpses of others along the way, but the main lineup is Cosmic Boy, Saturn Girl, Lightning Lad, Shadow Lass, Chameleon Boy, and Brainiac 5. CA: When you're doing a Legion crossover, the three founding members are pretty natural to include, and there's no way fans of both won't want to see Brainiac 5 and Spock together, but was there any other reason you chose to go with those Legionnaires? CR: We were limited to six because that's the number of transporter pads on a Constitution-class starship (and, hence, the number of Enterprise crewmen we'd be using). We choose these Legionnaires in particular because they offered a good representative sample of the LSH, because they offered interesting contrasts with Kirk and company, and because their looks and powers would make more sense alongside the Star Trek characters. CA: Kirk and his crew have these really strong personalities, but it seems like it would be easy to lose them in the flashy super-powered action. Is it difficult to find the balance in the way they interact during quiet moments, as opposed to when the action starts? CR: I don't know, the personalities of Kirk and his crew have stood up pretty well to any number of god-like aliens and super-advanced intelligences capable of changing reality at a whim. I think they can handle a little bit of lightning, shadow, or magnetism without TOO much trouble. CA: Ha! I was thinking that personality wise, the Enterprise might outshine the Legionnaires. CR: I'm not worried. I think the Legionnaires will be able to hold their own. CA: What about the villains? Are we going to see a team-up on the bad guy side as well, or is there a new threat that brings them together? CR: Mmm. Well, we WILL be seeing a lot of familiar faces from the rogues galleries of both series, but as to who is ultimately behind it? I'm afraid you'll just have to wait and see. CA: Aw, c'mon, you've got to give me something on who's appearing! The Fatal Five Plus Finnegan? 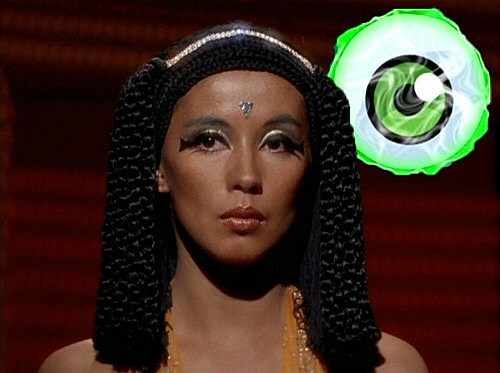 The Emerald Eye of Elaan of Troyius? CR: Let's just say that you shouldn't be surprised to see a war between the Khunds and the Klingons, or an appearance by the Borg of Tyrraz, or tense negotiations between the Controllers and the Organians. CA: One of the things I find really interesting about this crossover is that we've seen a lot of time travel stories from Star Trek in the past -- or at least stories where they end up on a planet that just happens to be the 1920s or ancient Rome -- but if you're going by when they're set in their respective universes, this is the first time that the Enterprise has been visited by people that are actually from their future. Does that come up at all? CR: It just might, at that! CR: The story begins with the USS Enterprise returning to Earth late in their original five year mission, so Kirk can give the commencement address at Starfleet Academy. But when he and his bridge crew beam down to San Francisco. They find themselves materializing on an unfamiliar Earth. Nothing is as it should be. 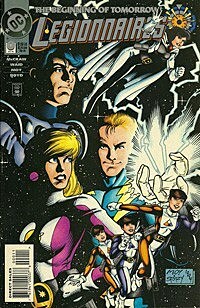 Meanwhile, a group of Legionnaires are returning to their own era in a time bubble after a mission to the past, but an eddy in the time stream forces then to crash-land on 26th century Earth. But while it IS Earth, it isn't the 26th that their history records. Both teams quickly learn that something has changed history, preventing their own histories from ever coming into existence. And unless they find out what changed and work out a way to fix it, the worlds they knew will never have existed. CA: Who are you working with on art? CR: Jeffrey Moy on pencils and Philip Moy on inks. And the art looks amazing so far. CA: Wow, those guys definitely have a history with the Legion. CR: I know, and they are killing it. And for the covers, IDW has lined up an all star assortment of past LSH artists that you're not going to believe. CA: All right, just for fun: Who's your favorite crewman and who's your favorite Legionnaire -- at least from the six of each you're working with -- and how do they stack up against each other? CR: The nine year old me would have said Kirk and Cosmic Boy, respectively, so I'll stick with that for now. As for how they stack up against each other, one is a magnetic personality (if soft-focused alien princesses in mini-skirts are any indication) and the other is just magnetic. CA: If you had to exchange one crewman for one Legionnaire, who would go to the Enterprise and who would head off to the 31st Century? CR: Well, my go to answer is that Ultra Boy would work in any universe, so I'll go with him from the LSH side, even though he's not in this book. And from the Enterprise? 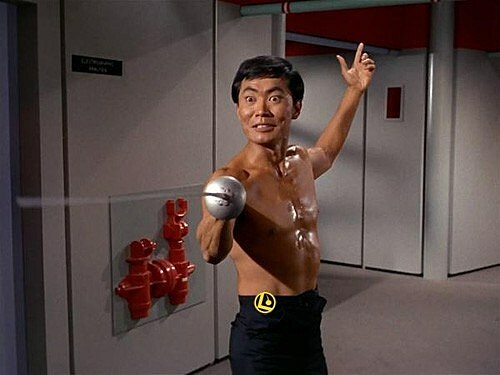 I say Sulu, because he's a swashbuckling badass, and has always been waiting for his moment to shine. 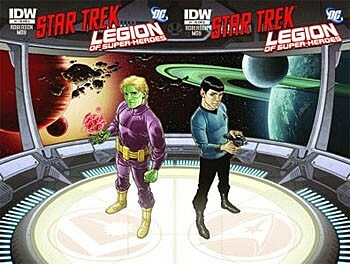 Star Trek / Legion of Super-Heroes is a six-issue mini-series that debuts in October from IDW and DC Comics.